Consider that many people here live day to day, buying only what they need for the day because it is all they can afford. Additionally, many people depend on the wages they receive every single day selling tortillas, fruit, vegetables, housewhares, etc., in order to buy the food they need. If everyone is in curfew, they don’t sell. Add to that the fact that many of the corner stores where many people buy their rice and beans are running out of food, because the distribution trucks are not allowed on the streets. This is after only one day. Supposedly, the curfew is supposed to be ending right about now (6 am Honduras time). It seems like the situation is at boiling point and the future of the coup government will be decided in the next 24 hours or so. 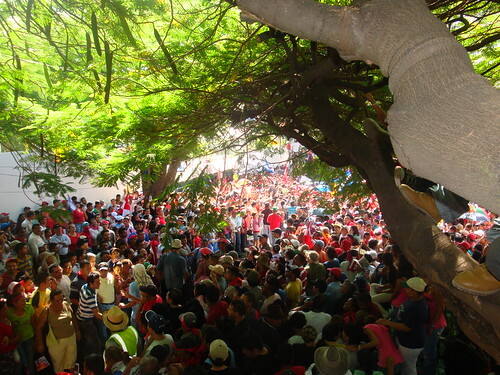 I’ve been following the coup in Honduras and the resistance to it quite closely this summer, although I haven’t written much about it since I didn’t feel like I had much original to say. I still don’t have anything profound, but I do have accumulated links, images and videos that you might find interesting. This is a letter to YAR readers from Kathleen Kern, a colleague of mine at Christian Peacemaker Teams as well as a novelist. I was a fan of her first novel, Where Such Unmaking Reigns and I’ve also read the manuscript she describes below. Since I last wrote, Allan has provided this info that completes the reporting from the Winnipeg meetings. (Thanks Allan)! A document entitled “Recommendations from September 2009 Inquiry Task Force Meeting” has been posted on MCC’s website that gives further context, and charts a path forward in addressing the concerns that were named. I would encourage each of you to read this. MCC relates to what you are about as Young Anabaptist Radicals, and this process is significant for MCC and the broader church community. The “final” meetings of the New Wine/New Wineskins Inquiry Task Force (ITF) committee were last weekend in Winnipeg. I thought some of you may want to know about it. MCC is trying to deepen existing bonds of connection and respond to world in a new way through modification of its vision, mission, priorities, values, and approaches…as well as its structure. The New Wine/New Wineskins process was a broad consultation to help think through how we do this. · the fragmentation of international program into national entities. How can we maintain (and improve) MCC’s ability to carry out its mission if international program is given to national MCCs? · denominations not having sufficient representation on the governance of the proposed national MCC entities, nor the central entity. Hello. My name is Josh. And I am an Anabaptist. Well, pretty sure anyway. Theres only a small number of people using the label of Anabaptism is Australia, tho many more exploring the traditions and those related to it. I came to anarchism and anabaptism through a marrying of my activism and earlier evangelicalism. My wife and I live in a small community in Perth called Peace Tree. Peace Tree has been around since ’04, living in a forgotten neighbourhood trying to work out how to live as Christians in a society more interested in security and money. Our community is small, a max population of 8, but perhaps 20 with sympathizers. My wife (Amy) and I are actually away from home at the moment as well. We’ve been 5 months in Timor Leste (me working on a Permaculture garden and Amy mostly teacing english). This coming weekend we go the UK for 5 months and are keen to catch up with communities and like minded ppl. I came across this blog trying to find out what is happening (I saw another community member – Jarrod Mckenna – being written about as well). So, yeah, hello – I like coffee and gardening.